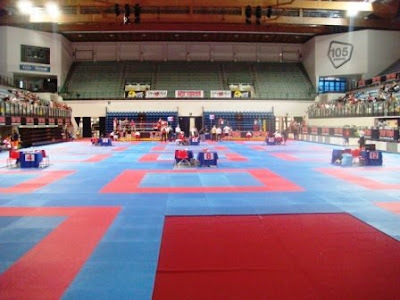 The 2009 Rimini World Cup is just over and WAKO had another great event with amazing numbers: 1900 the competitors in representation of 27 countries. The most successful style was, once again, "semi contact kickboxing" or "point fighting" for which WAKO have used 12 fighting areas. The Rimini World Cup will be remembered not only for the beautiful and well equipped sport-hall WAKO have used, but also because they had two positive tests: for the fist time ever WAKO has adopted the electronic "Open scoring system" even in Full Contact and they have officially launched a new mat style (which will replace the Aero-kickboxing from 2010) called "kick light", a continuous light contact sparring style where competitors could also attack the legs of their opponents. About a 100 the fighters who took part in this new competition. In particular they had 3 gold medals for Jordan fighters who did really well.